Do you want to fly but you need support? Do you want to fly but you don’t know how? 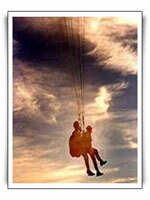 Do you want to try paragliding but you don’t want to spend money for paragliding course? Do you want a special gift for someone? If YES was the answer once at least tandem flight is the right for you! 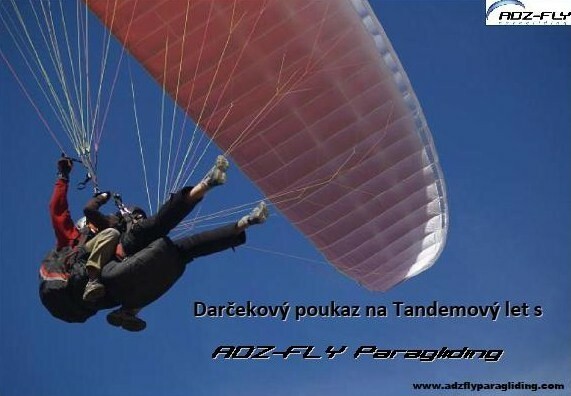 ADZ-FLY is offering tandem flight – unforgettable experience – to you, your family, to your friends, company. Tandem flight is flying in two with experienced tandem pilot. Intention to fly in the sky, sportswear and sports shoes are the only things expected from you. ADZ-FLY mostly flies close to Sabinov but if you are interested you can enjoy tandem flight almost everywhere in Slovakia. Just contact us! Although paragliding is year-long sport the weather is a limiting factor. Therefore it is impossible to plan the flight in the long term. It is necessary to enquire at least two days before. Tandem flight 10-15 minutes long will cost you 99€. If you will be interested next ten minutes will cost you 10€ each. Discount: for the pair or group of buyers is the price of the tandem flight 75€. Everyone who enjoyed tandem flight with us can have 5% discount from the price of basic paragliding course. The price contains lending of equipment, insurance, flight and great experience! Transport to the take-off is included too. Just try it! Do you want to order a tandem flight or do you have any question?